According to various sources, Tokyo’s 23 wards are inhabited by ca. 10 million people, the entire metropolis claims a population of over 13 million, while 38 million people in the Greater Tokyo make it the most populous metropolitan area in the world! No wonder it’s also one of the tourists’ favorites! According to some sources, in 2017, the number of visitors to Japan was 28.69 million, up by almost 20% as compared to the previous year. The capital claims about 20-25% of this staggering number. You’d probably need weeks if not months to explore all the attractions Tokyo has to offer. But even if you’re here only for a little while, you can still get a taste of its otherworldly atmosphere. 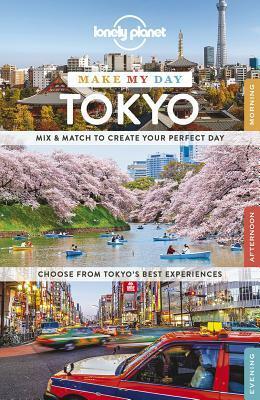 Lonely Planet’s “Make My Day Tokyo” Guide, which I used to plan our trip. First things first. To make an effective plan for your monster 1.5-day visit, you first need to know how much time you have on disposal. Tip: Note down when you’re arriving and when you’ll have to leave on your way back. Allocate some time for sleep and subtract that from the total time for the trip. Put down the final digit. That’s how many (or few) hours you have left to enjoy this mind-blowing city. Think about your traveling pattern. What kind of tourist are you? Laid-back, adventurous, a foodie? Do you enjoy exploring one’s culture, language, history, and lifestyle? Are museums your thing? Or do you prefer to keep away from them and immerse yourself in the hustle and bustle of busy streets and real life? What I am looking for in every trip is to discover different cultures and understand foreign perspectives through customs, religion, rituals, lifestyle, and language. Therefore, while planning my Tokyo itinerary, I was looking for places of cultural significance that could tell me more about the Japanese spirit than any guide. I also love exploring the local cuisine and always hunt for street food or restaurants that are far from the main tourist attractions. Food halls, cheap bars, and local markets are the essential points of interest to me. Tip: Discover your traveling pattern, write down the must-see places you can’t miss during your visit, and move on to the next step. Do you prefer to walk, ride a bus, or use taxis when sightseeing? (The last option may cost you a fortune, though, as Tokyo’s taxis are supposedly one of the most expensive in the world; a good description of the local taxi services is provided in this post about Tokyo taxis)? Whatever you choose, if you only have a day or two in this city to spare, figuring out your transport ahead is a good idea. Especially that Tokyo metro can be quite confusing, particularly for visitors who hadn’t had a chance to use a similar system too many times before. The network is enormous, several companies run it (together with the rail operators), and many stations are tre-men-dous, with dozens of exits. Tip: Even for a day or two (or maybe especially then), consider buying a metro card or a discount ticket for multiple rides / 24 hours, etc. Check the official Tokyo Metro website for more details: https://www.tokyometro.jp/en/ticket/index.html. See also: 6 Tips for Navigating Tokyo Metro System by Forbes and Getting Around Tokyo with the JR Pass. What’s ‘convenient’. I personally think that location is critical. When you just have several hours to experience a city as enormous as Tokyo, you may not want to waste your time commuting. That’s why when looking for a place to stay, I’m always trying to book a place that: a) is close to the center b) has breakfast included in the booking price, so I don’t have to spend time on shopping and cooking. In Tokyo, I found a fab, inexpensive hotel on Booking.com, APA Hotel Hanzomon Hirakawacho. It’s cuddled in-between residential buildings, close to the central Hanzomon station, a few minutes walk from the Imperial Garden. Why I liked it so much (despite having the tiniest room ever)? The location was central, the breakfast was a delicious mix of Japanese and continental (however, if you’re not bold with food, stay away from the local delicacy – yobu 🤔), and the room, albeit minuscule, had all amenities provided, with a super-comfortable, cozy bed and pillows. It cost us ca. 50 euro for two people per night with breakfast. Not bad for central Tokyo, I think. Tip: Assess what makes more sense for you, accommodation that’s close to top attractions or a more affordable place to stay in a remote area. Don’t forget to include the transportation costs in your estimation. Breakfast appetizer: Tofu with soy sauce and miso soup with wakame. Before I came to Tokyo, almost everyone warned me about its ridiculous prices. And I still don’t understand why. Sure, you can easily splurge a few hundred dollars on fugu here. Welcome to the world’s gourmet capital! Nevertheless, there’s an abundance of places to eat cheap and well. Street food, cafes, ramen bars, sushi places, fast food restaurants, maiden cafes, robot and owl cafes, creperies,… Tokyo has it all; the variety is enormous and the food – delish! Depending on the meal and place, we were paying 400-1200 yen per dish, which is… 3-7 Euro. Hardly extravagant. But, the proof is in the pudding. Our hotel breakfast. Included in the room. Fried octopus for a fiver. Tip: See where the locals eat and follow them. Try restaurants further away from the main streets. Check out kombini or corner shops that actually serve quite decent food that costs peanuts. Bon appetit! Ready to See Tokyo in 36 Hours? I hope your next visit to Tokyo will last longer than 36 hours (and mine too!). However, the above tips apply to any destination. Decide how much time you have, set a tentative plan, figure out how to get to each place, make sure you have an excellent place to stay in a strategic area, and don’t get obsessed with planning your meals. Just focus on your itinerary and enjoy. Thank you, Betsy. It is such an amazing city that everyone will find something to enjoy there, even if they visit for a day. I can’t wait to go to Tokyo and Japan again and have a chance to explore more.